If modern and ancient folklore can be believed, Samhain is the time when our world and the Other Side are the closest to being one. In BBC’s Merlin, Morgana used this link to tear the veil between worlds. The Celts believed the year was divided into two parts, the lighter half in the summer and the darker half in the winter. Samhain, or Halloween as it is now called, was the division between these halves. The Celts believed that the veil between our world and the other world was thinnest at this time. Oíche Shamhna (October 31) is Halloween and Lá na Marbh (November 1) is the Day of the Dead, or All Saints Day, when those who have passed away are remembered. According to the American Folklife Center at the U.S. Library of Congress, Celts wore costumes to confuse the spirits now roaming our world and to avoid capture. Samhain is the first day of winter. It is the end of one pastoral year and the commencement of the next. It is the time when the hopes and plans of mortals focus below the earth and around the hearth, paralleling the germination of the seeds and plants, or the hibernation and byring of the beasts. It is the time when the night becomes longer than the day. During this festival, summer becomes winter, day becomes night, life becomes death; and the barriers between the natural and the supernatural are temporarily removed. It was at Samhain then, that the gateways to the ‘Otherworld’ or the ‘sídh’ were opened and divine beings, the spirits of the dead, and indeed mortals could move freely between one world and the next. Sídhe are the special dwelling places of the ‘otherworld’ people and have also been called Fairy Hills, such as Brugh na Bóinne, best known for the Newgrange site. Many of the more curious and supernatural events in Irish mythology are associated with Samhain, including two of the legends associated with Newgrange and Aonghus. In more recent times Irish folk memory led to such practices at Hallow Eve as leaving pairs of chestnuts by an open fire as auguries for betrothed couples. If they stayed together on being heated then harmony would prevail. If they scattered apart there would be strife in the union. A good fire was always left burning that night for the fairies. People avoided taking shortcuts across beaches, fields or cliffs for fear the fairies would lead them astray. A candle knocked over on Hallow Eve night was an ill omen. If a girl sat before a mirror at midnight eating an apple she would see her future husband in the mirror. Like all main festivals, Samhain is a gateway, a transition from one season to another. In Celtic mythology, at the heart of every gateway is a paradox. The threshold is literally between two worlds but is, in itself, in neither and in both at the same time. The old tales tell how the gates of the world stand open at this time. Journeys to the “other world”, either metaphorically or otherwise, may well be transformative. It is for this reason that Samhain can be seen as a time when the past and future are available to the present. Obviously Samhain is one of the great gateways to the Other Side. But there are others. Llyn Cwm Llwch is a small lake that lies below the highest peak in South Wales called Pen y Fan. Legend tells that there is an invisible island in the lake that could only be reached by a door that was set in a rock. Every May Day the door would open and some of the bolder local people would enter and pass down a passage that opened up in a garden that was set upon the island. Although the shores of the lake could clearly be seen from the island, the island remained invisible to those on the shore. Those who entered the door and visited the invisible island found themselves in an enchanted garden. This garden was filled with the most beautiful flowers of the most wonderful colours and trees hanging with luscious fruit ripe for eating grew all around. Beautiful birds sang happy songs in the trees and butterflies flitted between the flowers. It really was a most enchanted place. Even folktales have whispers of the Other Side. Anyone who’d ever read “The Juniper Tree” by the Brothers Grimm will know that it’s a horrid tale about stepfamily – but it’s also a tale about the Other Side and Thin Places. – The Juniper Tree, the Brothers Grimm. As creepy as it is, the juniper tree gives a woman a child (let’s not get into that) and she dies after giving birth. Her husband remarries and his new wife kills his son – makes their daughter believe she’d done it and then cooks the boy in a stew. In the extract above, the little boy’s sister buries his bones in the shadow of the juniper tree. Still a little unclear about what Thin Places are? Thin Places and the Other Side are usually connected. What is a thin place? A thin place is a place of energy. A place where the veil between this world and the eternal world is thin. A thin place is where one can walk in two worlds – the worlds are fused together, knitted loosely where the differences can be discerned or tightly where the two worlds become one. Thin places aren’t perceived with the five senses. Experiencing them goes beyond those limits. Fascination with the “Other world” has occupied our human minds since early recordings of history and likely before that. A thin place pulsates with an energy that connects with our own energy – we feel it, but we do not see it. We know there’s another side – another world – another existence. To some it is heaven, the Kingdom, paradise. To others it may be hell, an abyss, the unknown. Whatever you perceive the Other world to be, a thin place is a place where connection to that world seems effortless, and ephemeral signs of its existence are almost palpable. I’ve always loved the mystical aspect of Ireland, the Irish fairy lore, the island’s lush greenery and frequent rainbows. 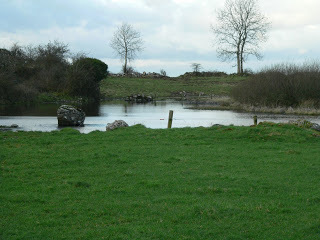 Several years ago, my husband and I discovered tiny, hidden away Caldragh Graveyard on Boa Island in Lower Lough Erne, County Fermanagh, Northern Ireland. A prehistoric pagan stone is located there, with a face carved on either side of it. It’s the mysterious stone that draws most visitors to the ancient cemetery, where it sits amidst tall green grass, thick bushes and trees, and many broken headstones. 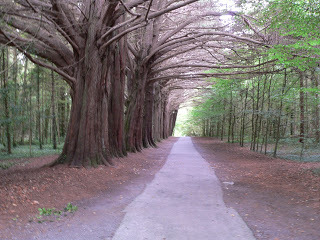 After our first visit, I began to get ideas for my book, THE THIN PLACE. In Ireland, a “thin place” is a spot where the veil between our world and the Celtic Otherworld, where fairies dwell, is very thin. The first essay in that volume, Jerry R. Wright’s “Thin Places and Thin Times”, discusses the Irish notion that our everyday world and the “other world”, that is, the invisible, fairy, or unconscious, are right next to each other, and in many places the barrier between the two is quite thin, and it is at these thin places and times that we can experience the other world. The most commonly asked question by visitors to my Thin Places blog or my Who Cares What I Think blog is “what are thin places?” or “how do you identify a thin place?” Thin Places are places where the eternal world and our physical world meet and mingle. I didn’t coin the term, and it is widely used by mystics and those who write about Celtic Spirituality. 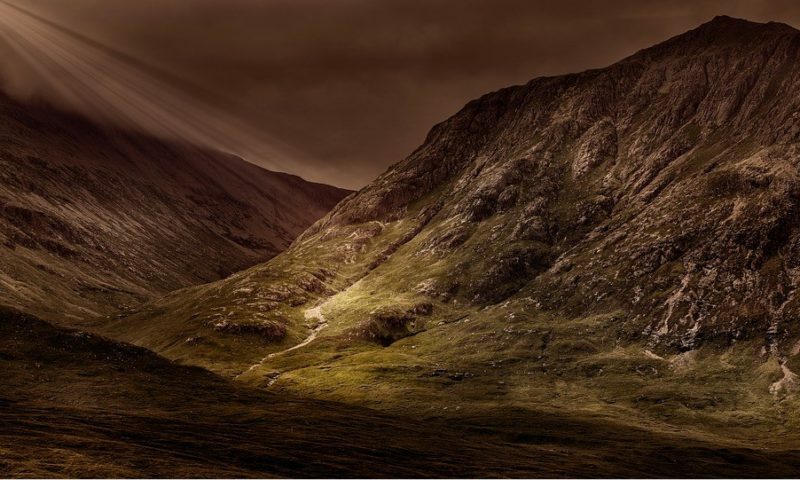 The term thin place comes from the pre-Christian culture in western Europe – particularly Ireland – and refers to a place where the veil between this world the “other world” or the “eternal world” is thin. Old tales tell of people and beings of the other world being able to pass back and forth between worlds in thin places. 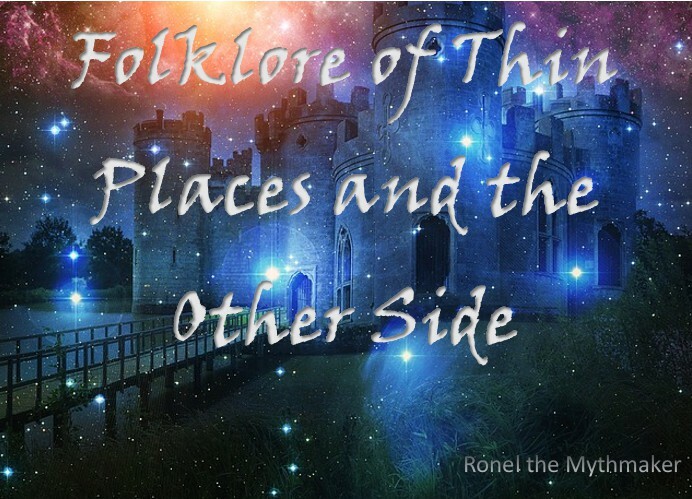 In Irish mythology, a “thin place” was a divider between the physical, tangible world and the “otherworld” of dreams, the afterlife, and other unseen but very real dimensions hiding behind the veil of reality. Thin places could be actual places or they could be seasons of change. The night of Samhain (sow-in), the Celtic precursor to our Halloween, was believed to be a night where the boundaries between our world and the unseen world could touch, as the wall between them shakes and dissolves. (Do you watch Dr. Who? Thinking of this in terms of the Whovian parallel universes helps me visualize this as more than just a quaint, pagan concept.) Thin places were revered and afforded respect, but also feared because they were the places of the unknown. 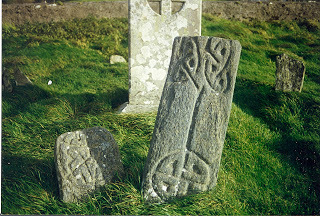 Physical thin places on the Irish landscape include prehistoric monuments and markers. The peoples who built the cairns and dolmens we can still see today were most likely not the Celts, who arrived in Ireland later. They were an earlier people, living in Ireland as early as 5,000 years ago (and more! I’m going off memory here). 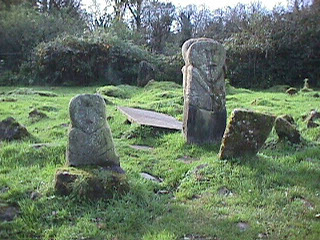 When the Celts arrived, they interpreted the dolmens and passage tombs as structures built by the gods and goddesses who inhabited the land — the Tuatha de Danaan, or the Tribe of Danu. These gateways were portals to the Tuatha’s domain and venturing too close could yield disastrous results for humans. These beliefs gave birth to the stories and the eventual evolution of the “fairy people” who could steal humans away to their lands below and beyond the horizon. 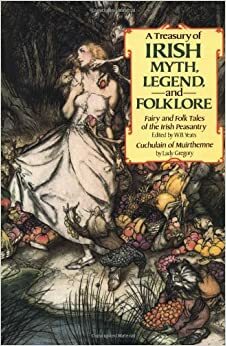 In many stories in Irish folklore and ancient mythology, contact between humans and fairies occur near a physical thin place (a fairy fort or a fairy ring) or a spatial thin place (Samhain or a night of a full moon). Kealkil was not on my agenda of things to see on that trip. I’d never heard of it. There are hundreds of stone circles scattered throughout Ireland, and west Cork has a large cluster. 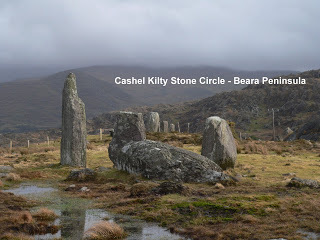 The day before I visited Kealkil I had driven the Ring of Beara, found and visited five stone circles, and walked nearly eight miles in order to do so. 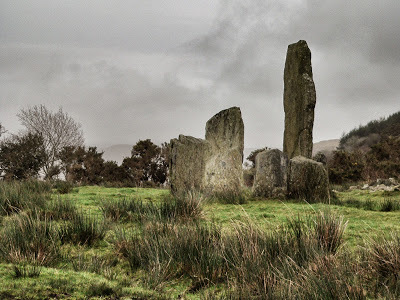 I saw Uragh Stone Circle, Shronebirran Stone Circle, Cashelkeelty (my all time favorite), Ardgroom and Kenmare Stone Circles. On earlier days on this same trip I visited Drombeg Stone Circle and the Grange Stone Circle – the largest in Ireland. Thin places are specific sites with a mystical quality – where the veil between this world and the eternal world is thin. Ireland is littered with these places – some are very familiar to the traveler like the Hill of Tara, Newgrange, Drombeg stone circle, Glendalough and Carrowmore. But some are not so familiar and are a “must see” for the pilgrim traveler or those looking to connect with eternal world. Using Thin Places and the Other Side made completely sense to me as I wrote a story taking place on Samhain. “Green and blue lights skittered through the forest, followed by red and pink. ‘What do you remember about Samhain?’ the rabbit asked carefully, hopping over another fallen tree. I hope you enjoy reading the sixth tale in the series. Comments can be left here or on Wattpad – I always appreciate feedback. Do you believe that there are Thin Places? 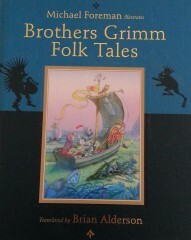 Can you think of more folktales where Thin Places and the Other Side feature? Love all that mythology. From the pic, I can see why people felt that lake had a magical doorway.